Possibly replacing the DW-5750 revival as the most surprising release of the year, the G-Shock GMW-B5000 series features metal bezels and bands with the classic square shape plus a sapphire crystal, Tough Solar, Multi-Band 6, and Bluetooth V4.1 connectivity. Reminiscent of the solid gold Dream Project concept watch, the GMW-B5000 has two variants: the silver GMW-B5000D-1 and gold GMW-B5000TFG-9. We don’t have any official information from Casio yet but have heard that the watches are limited editions made of steel with a price of around €500 EUR for the silver model and €600 EUR for the gold model. 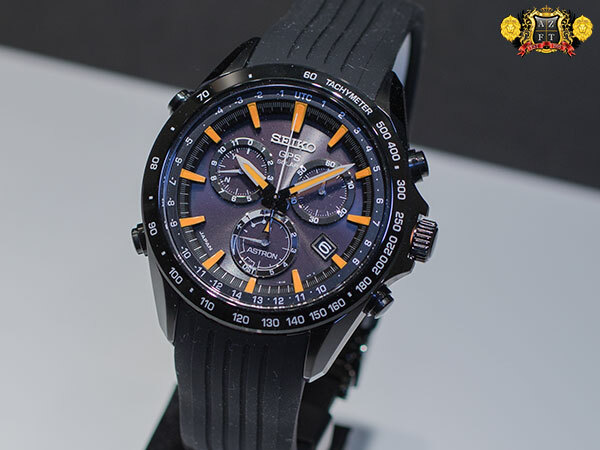 It is believed that the GMW-B5000 has a full stainless steel housing and screw-back case like the GW-5000-1JF. A European distribution site states that it has a phone finder and flight log memory functions, as well as the usual features like world time, stopwatch, timer, 5 alarms. It is fully shock-resistant and water-resistant to 200 meters. Unlike most 5000-5600 models, it has a LED light instead of the EL backlight. No word yet on if it has call and message alerts like the GB-5600 series did. The solar panels on the face have a brick pattern that is reminiscent of the first-ever G-Shock DW-5000 and previous DW-5000 anniversary tribute models. This is the first time this brick pattern has appeared on a solar model. 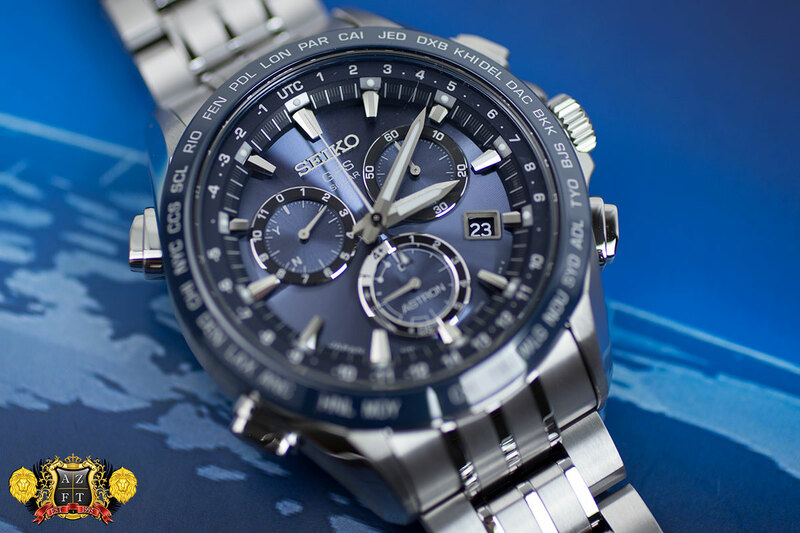 In 2014, Seiko introduced a new design for the Seiko Astron GPS Solar. The design draws inspiration from the stratosphere surrounding the Earth and was thus named the “Stratosphere” collection. The “Stratosphere” series has 4 terrific models to choose from, all of which are now in stock at exceptional savings! The 1st model released in the line up was the SAS031, which we are going to take a close look at today. The dial on both the SAS031 and its counter part in rose gold plate (SAS032) will have a faint map of the globe as viewed from the North Pole, and altered to coordinate the city codes on the inner bezel with the map. The translucent black dial stores a solar panel allowing the watch to recharge, and providing a maximum 2 year power reserve if in sleep mode. The dial lay out is the same as the previous Astron GPS models, with home time clock (an independent clock that does not adjust automatically) at 6:00 and the mode indicating hand near the 10:00. The mode hand will display the watches current power level if not in any other use. Below the power reserve is a small airplane icon. Adjusting to airplane mode will turn off your GPS receiver completely, so it cannot manually or automatically receive satellite signal. Below that is the day light savings adjustment, which can quickly be turned on or off by pushing the upper left button once, and holding the lower right button for about 3 seconds. Above your power reserve indicator is the satellite connection indicator. When the mode hand points to “1”, this means the watch is connecting to one single satellite, just to updates its accuracy, not timezone. 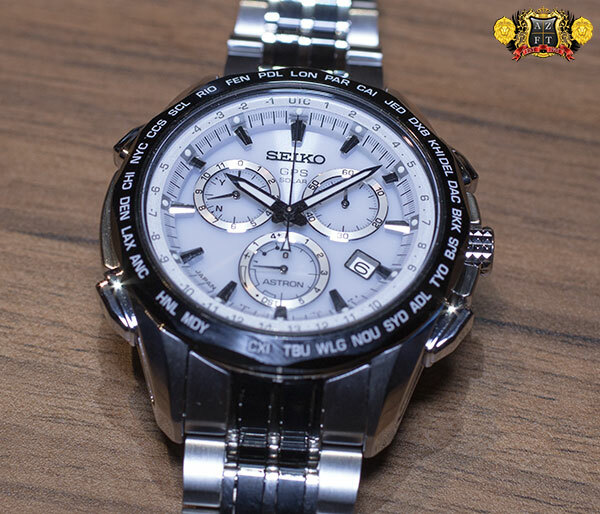 This will occur automatically if the watch is exposed to bright enough sunlight, due to a new smart sensor Seiko developed for this piece, or if you hold the upper right button for 3 seconds. 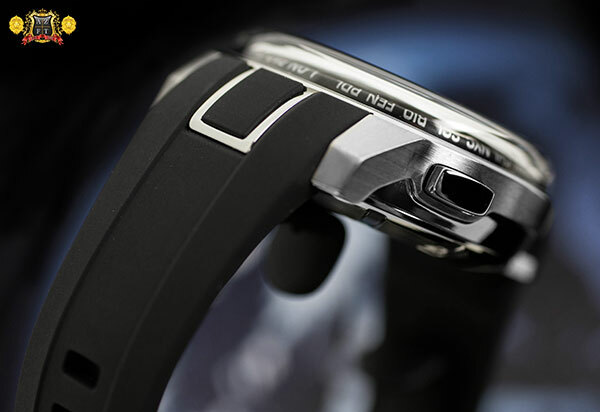 The “4+” is engaged when the upper right button is held down for 6 seconds, and this is when the Astron will actually determine your latitude and longitude, decipher which timezone you are standing in, and adjust the hands to that timezone. Thanks to over 10 years of development and over 100 patents, Seiko has their proprietary GPS satellite corrected 7X52 caliber used in the Astron GPS Solar series. Now we get into the new design developed for the “Stratosphere” series. You will notice that 1st of all, there are no ceramics in this line up. 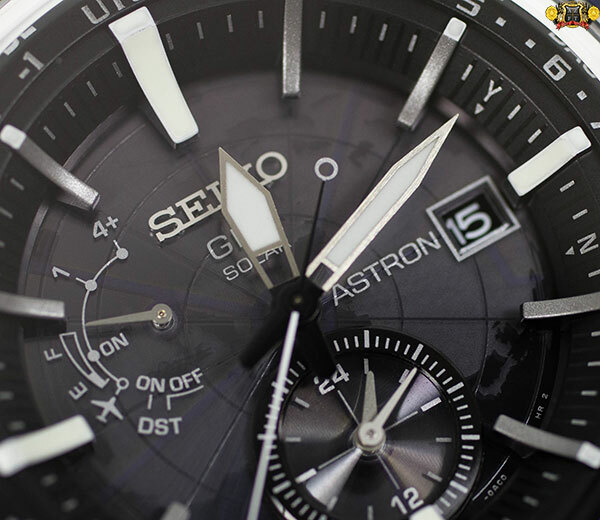 Typically, the GPS antenna ring (which was developed in-house by Seiko) sits underneath the ceramic bezel of Astron, in order to connect clearly. 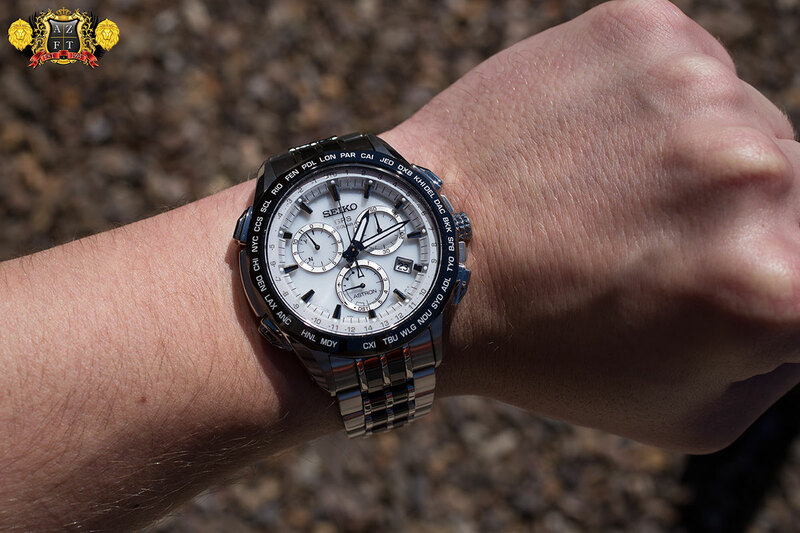 The “Stratosphere” uses a tremendous domed crystal that stretches nearly the entire diameter of the stainless steel case, an entire 48mm’s, and has the antenna underneath eliminating the need for ceramics. The case in total measures out at 18.1mm thickness, but the domed sapphire crystal is 5mm thick in itself. The crystal requires a labor intensive 10 hours of polishing in order to receive the smooth, domed, stratospheric design mimicking the second major layer of the atmosphere surrounding the Earth. The difference in UTC is easily read from the front of the dial while the city codes are big and bold on the sides. The natural Lumi Brite material used for its luminova is spectacular. 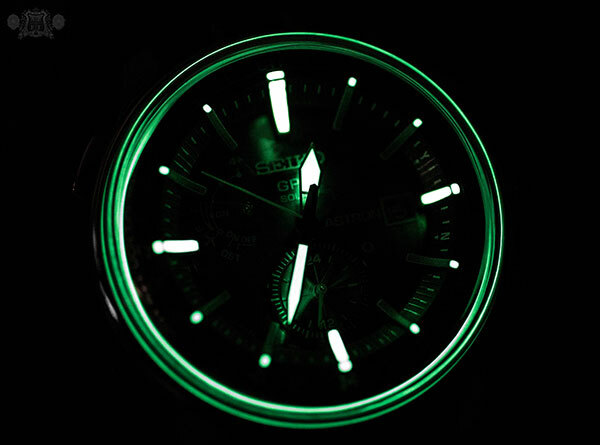 The large hands display a great amount of lume. Each index has lume, with 12, 3, 6 and 9 containing even more. The most unusual part is the ring of reflecting lume that surrounds the edge of the sapphire glass, creating a cool and futuristic look, that lights up the dial tremendously. 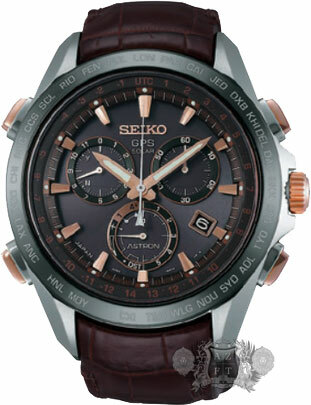 And the SAS038 will have rose gold accents on a dark grey croc strap. This model is also labeled as a “Shop Limited Model” in Japan. The SAS032 is the rose gold variation on silicone band. Those interested can order these new models directly on our site HERE. 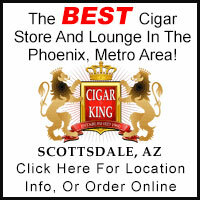 Please feel free to contact us at 1-800-486-3996 with any questions or submit an inquiry through AZFineTime.com. 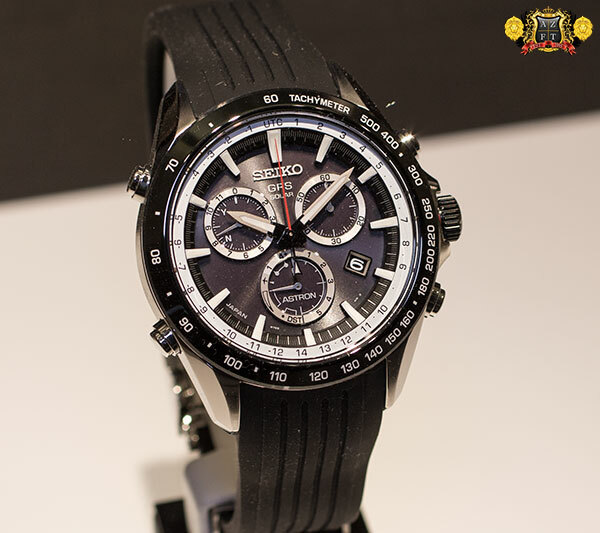 At the beginning of February 2015, Seiko Japan announced their first collaboration with Giorgetto Giugiaro on their widely popular Seiko Astron GPS Solar Chronograph. 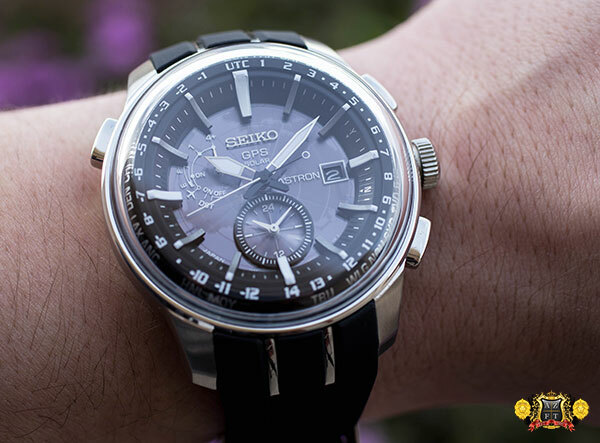 This holds a special place in many ways for Seiko fans… Not only is Giorgetto Giugiaro a world acclaimed car designer, he also worked with Seiko during the era of their first analog quartz chronographs in the early 1980’s. 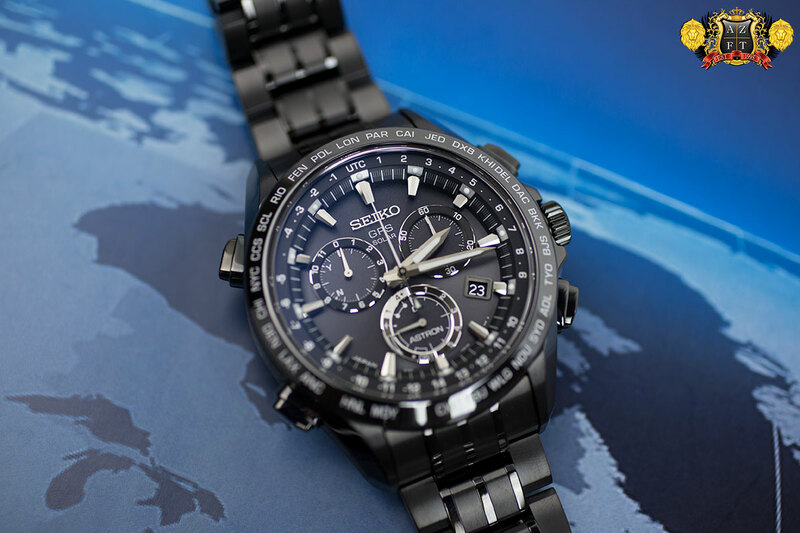 It seems only fitting that this renowned designer who collaborated with Seiko on breakthrough technology of the 80’s, is contributing to their latest breakthrough, the Seiko Astron GPS Solar Chronograph. 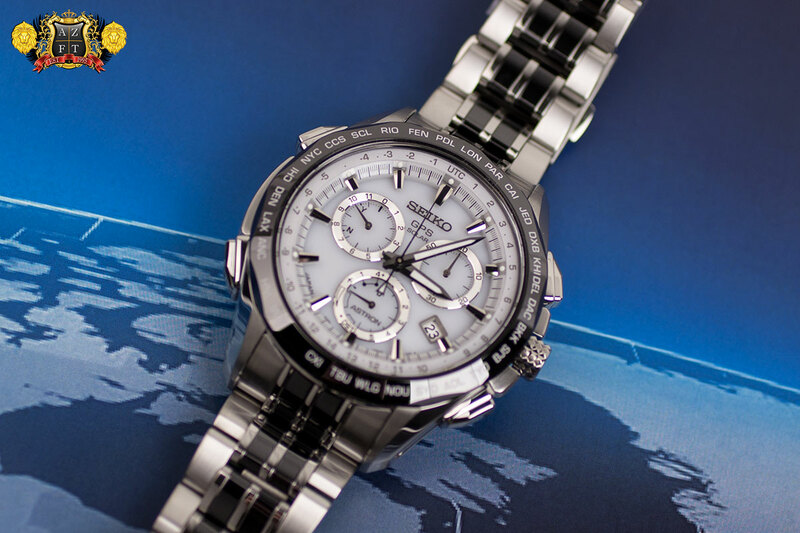 For 2015, Seiko is introducing at least 3 new models of the Seiko Astron GPS Solar Chronographs to the line up. The first addition we have seen is the titanium SSE025, with rose gold accents for the hands, indexes, crown and pushers accompanied by a brown crocodile strap with 3 fold deployment clasp and Seiko’s Diashield coating on the titanium for added scratch resistance. MSRP is set at $2,550. 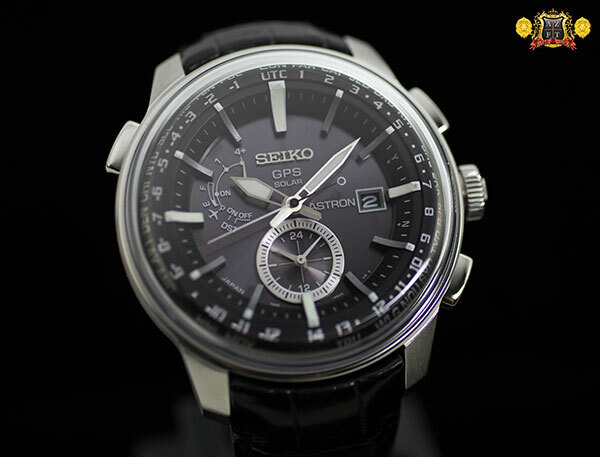 It was 2012 when Seiko first introduced their new interpretation of the Seiko Quartz Astron (the worlds first Quartz watch in 1969), introducing the Seiko Astron GPS Solar, the worlds first GPS controlled solar watch. 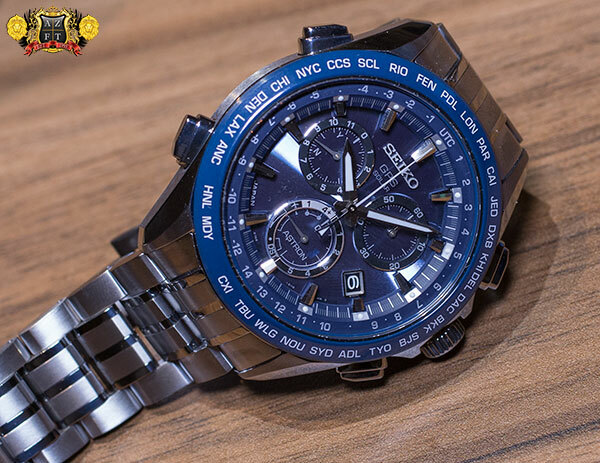 On September 19th, Seiko Watch Corporation had the official launch of the new variation, the Seiko Astron GPS Solar Chronograph, bringing not only new functionality to the Astron, but also reducing its size roughly 30%! 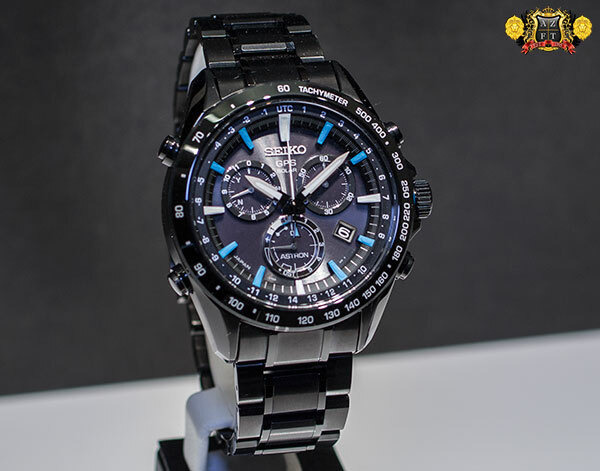 Today we are proud to bring you our first review of the new Astron GPS Chrono’s, featuring their 8×82 caliber. The SSE001 will be the 1st in the series and limited to 7,000 pieces world wide. The first thing people may notice is that this is the only Astron GPS to have a white dial. 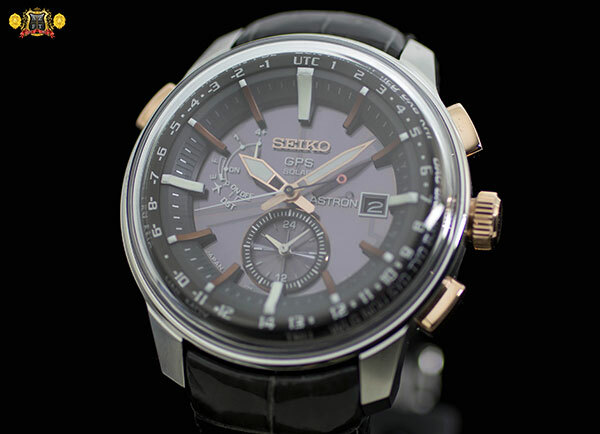 Thanks to a more efficient way to convert light to energy, Seiko was able to achieve new dial colors for the Astron GPS models. The SSE001 will also have a few distinct differences compared to the rest of the chronograph line up, including a faceted bezel design, unique crown and a case width of 45mm. The titanium bracelet on this model will also have ceramic center links, with titanium for the rest of the bracelet and case. This limited edition will also include a black leather strap with three fold deployment buckle. The rest of the silver toned titanium collection will include SSE003 (black dial), the SSE005 (blue dial pictured above), and the SSE007 (black dial with yellow gold accents). 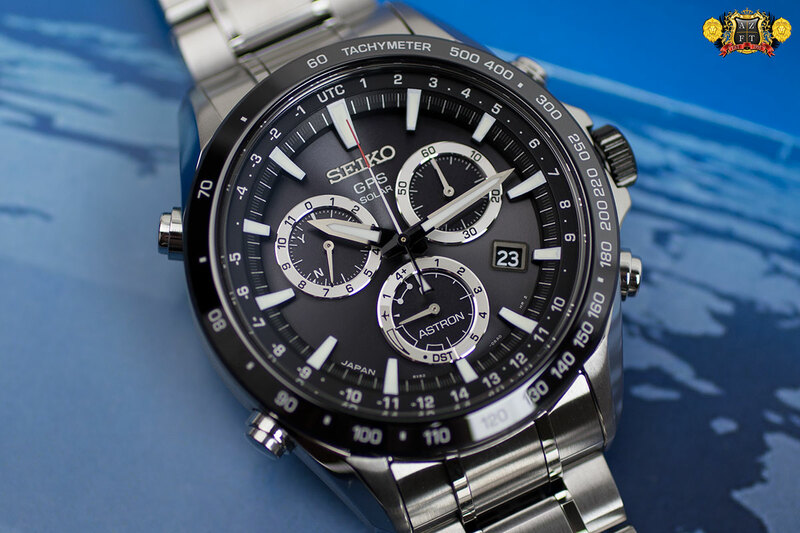 These use Seiko’s proprietary Bright Titanium which is 40% the weight of stainless steel, just as hard, and is capabale of receiving a unique finish. All models in the Astron Chronograph collection will be finished in Zaratsu polishing technique, giving it a distortion free mirror finish and then a special hard coating (known as DiaShield) is applied. DiaShield can increase the scratch resistance to nearly twice the hardness of stainless steel and protects its beautiful finish. 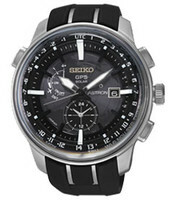 Other models in the Astron Chronograph line up will have a black hard coating process as seen in the SSE009 pictured above. Along with the SSE003, 005 and 007, these will have a rounded bezel as opposed to the faceted on the limited edition. These will also have city code indicators engraved into the bezel, making for easy manual timezone adjustments if necessary. Another new feature in these new Astron’s is the addition of an electronic crown. The electronic crown makes it easier to manually adjust timezones by pulling out the crown one click, the seconds hand will point to the current city code you are set for, and you turn the crown to the new desired timezone. The hands from there will adjust themselves. For daylight savings adjustment, all you need to do is hold down the upper left hand button for about four seconds with the crown out one click. This will turn daylight savings either on or off. Not all of the new Astron Chronograph’s will be titanium. They have also introduced several models in stainless steel, that also use DiaShield. The SSE011 is the first in the collection with black dial, stainless steel bracelet and a red accent at the tip of the second hand. The pushers for the chronograph on the right hand side are different in design then the titanium models but do function the same. 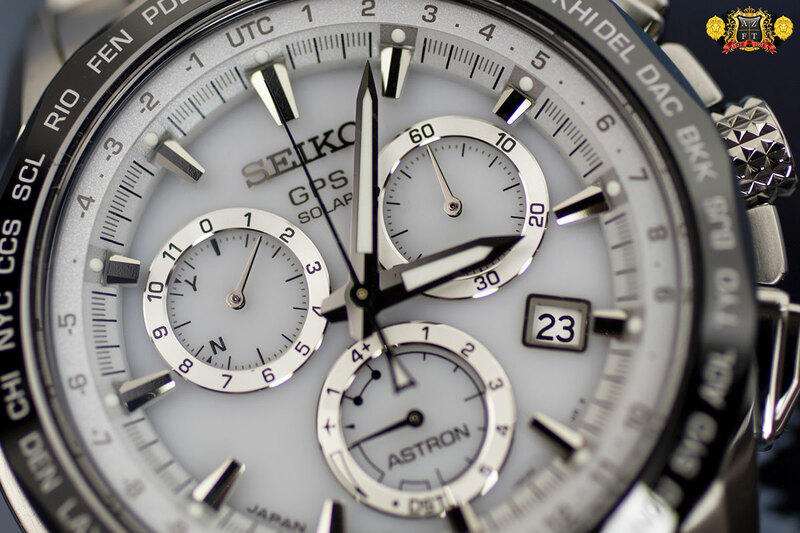 The chronograph functions as most do, using the upper right hand button to start and the lower right to reset. Those two buttons do not have any other function aside from working the chrono. The SSE013 will have a black hard coated stainless steel case and bracelet and blue accents on some of the indexes. The bracelet for the steel models differs from the titanium, using a 5 piece link bracelet, versus the titanium’s 7 piece. The weight difference is pretty substantial with titanium pieces at 110g, steel on bracelet at 175g, and steel on rubber at 125g. Another interesting note on the stainless models is that these will have a ceramic bezel with engraved tachymeter as opposed to the city codes. This allows to measure time and distance with its 1/5th of a second chronograph. The ceramic bezel still maintains its purpose as on the orginal Astron GPS models, with the in-house developed antenna ring underneath. Airplane mode, which turns off the GPS receiver, is much easier to do on the chrono’s. Just hold down the lower left button for four seconds. There will be 2 models in the line up featuring an extra-strength silicone strap. SSE015 (pictured above) and SSE017 (black dial, black hard coated case, and orange accents). These will both have a 3 fold deployment clasp and is extremely comfortable to wear. The SSE015 has a great sporty feel to it with white chapter ring and silver/white sub dial rings. It is very easy to distinguish all going on within the three sub dials. The 10:00 sub dial will measure your actual running seconds. Once GPS satellite connection is initiated by holding the upper left hand button for six seconds, the hand will indicate how many satellites you are connected to as well as if you received successful connection pointing to “Y” for yes and “N” for no. Your 6:00 sub dial show your current power reserve (which still maintains the 6 month power reserve running, or up to 2 years in sleep mode), unless you are connecting to satellites or running the chronograph. The hand will point to the “1” if the upper left button is held for three seconds. This means you are connecting to one single satellite for an accuracy update (which this also does automatically when exposed to bright light). When held for six seconds, the 6:00 hand will point to the “4+”. This is to pinpoint location and adjust the hands to that timezone, using multiple satellites. 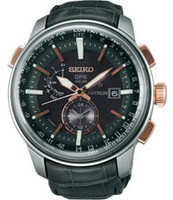 When running the chronograph, the 6:00 hand will measure up to 6 hours and your 2:00 sub dial is used to measure minutes. 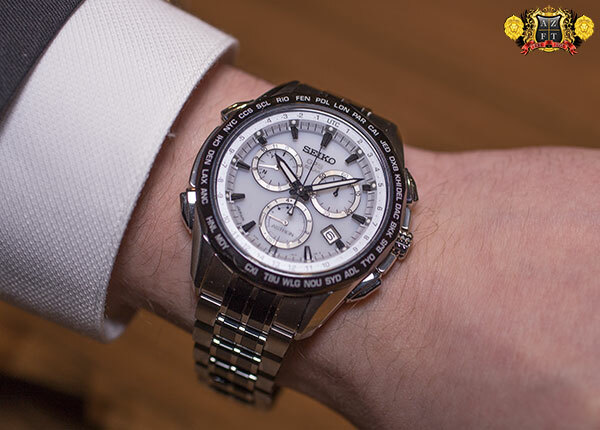 Your center second hand will only be used for measuring up to 1/5th of a second, only when the chronograph is running. The crowning achievement in the new 8X82 Astron GPS Solar Chronograph series is its size. At 30% smaller then the originals, the chrono’s are much easier to wear for dress or casual. Measuring at 45mm on the Limited Edition, and 44.6mm wide on the rest of the series, these pieces are much more wearable and compare to a typical self-winding chronograph at only 13.3mm thick! 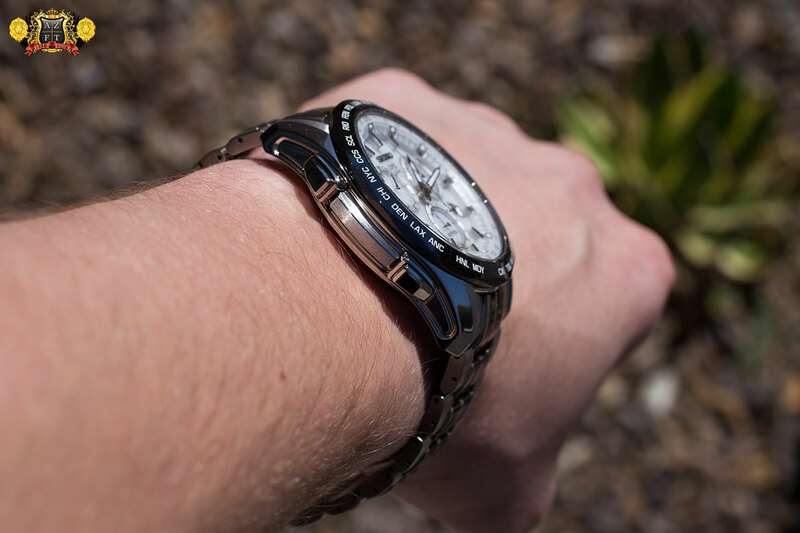 The prices in stainless steel vary from $1,825 on strap to $1,875 on bracelet. The titanium models are all $2,450, with the limited edition SSE001 at $3,300. 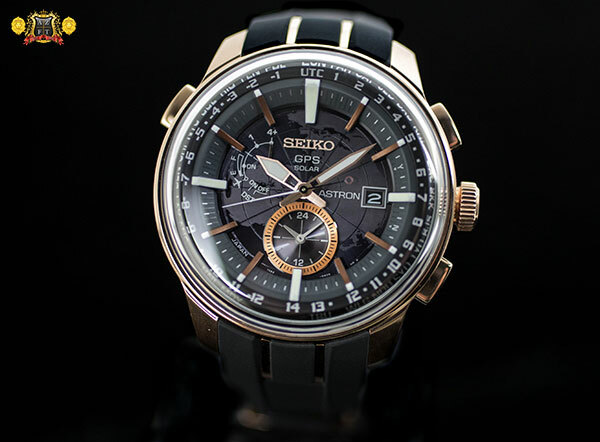 You can view and purchase and of the new Seiko Astron GPS Solar Chronographs HERE, including three new limited edition models SSE019 in all black hard coated titanium with rose gold accents. 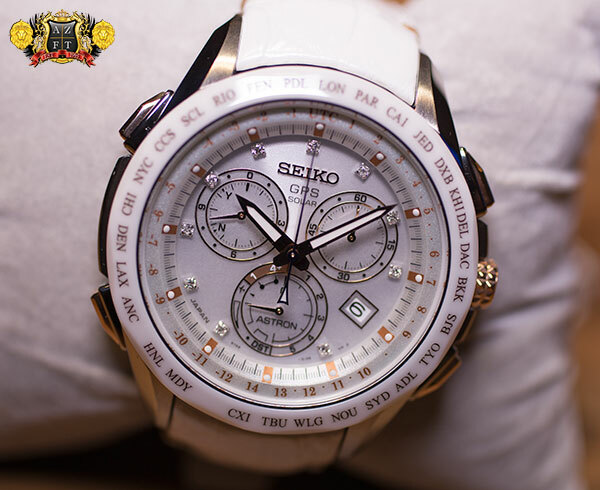 The first ladies Astron GPS with white ceramic, mother of pearl dial and diamond markers labeled SSE021. Finally, the new Novak Djokovic Limited Edition SSE022. These three models are scheduled for November delivery. 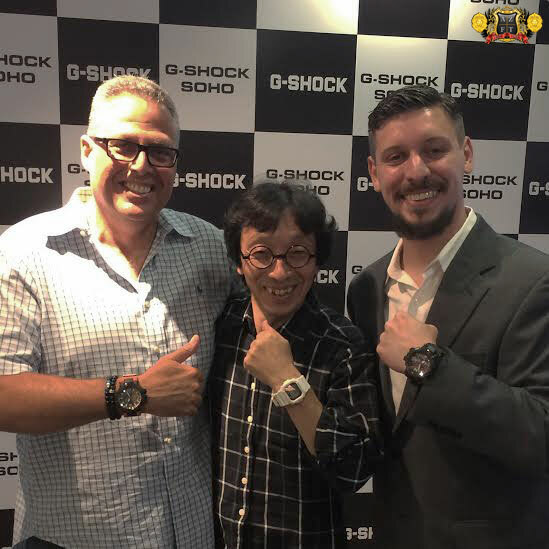 Last week I had the distinct honor and pleasure of going to New York for the national release of the latest and greatest from Casio G-Shock. 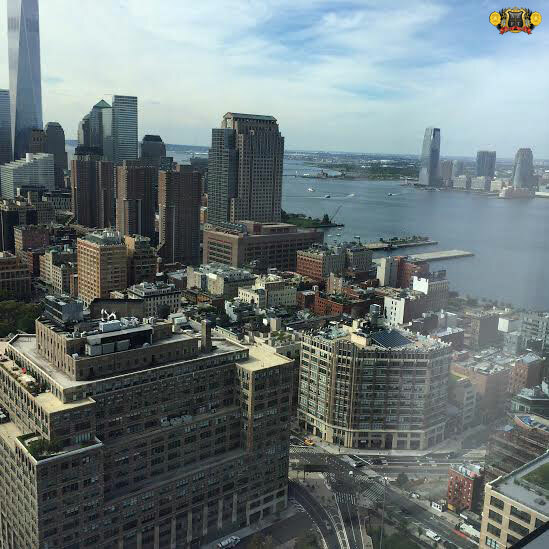 The event was held at the top of Trump Soho, and the image above is the beautiful view we had at the top. 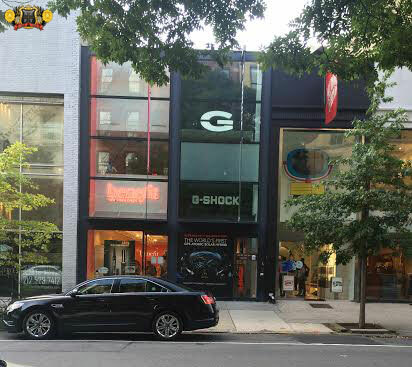 The first stop on my visit was to the G-Shock store in Soho, where I met up with our friend Michael Eckhaus, the Director of Sales for Casio’s watch division. 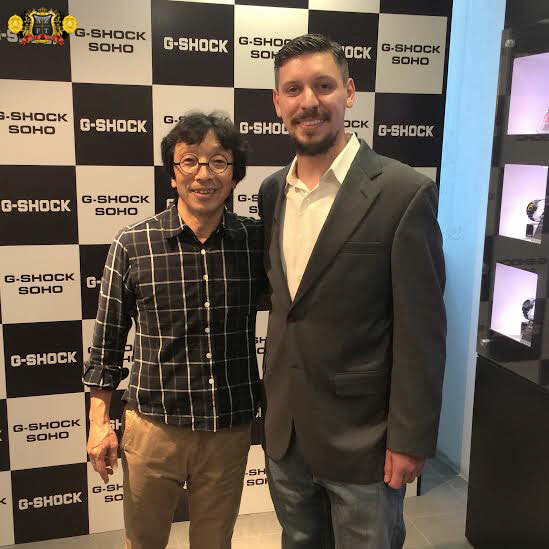 Coincidentally, the founder, father and creator of G-Shock himself, Mr. Kikuo Ibe was at the store signing autographs and taking pictures with some of his biggest fans. It was truly an honor to meet him. The upstairs of the Soho store is where we met Mr. Ibe which was not just in any room, but practically a museum of some of the great models of G-Shock ranging back from the early 90’s. People were standing in line to meet Mr. Ibe, even a couple of which got his autograph on their arms, and went right away to go get it tattooed. Their fan base is some of the greatest out there, with a strong dedication to the world of G-Shock. We even got ourselves a nice autograph for the store which is now on display. Mr. Ibe proved himself to be an extremely nice guy, and very funny to boot! The following he has created for the G-Shock brand is something like I have never seen, ranging from people who strictly collect G-Shock for colors, limited editions, and the funkiest pieces they can create, all the way up to avid collectors of high-end timepieces. The range of people into G-Shock is astonishing. The whole reason I was even there was because of the launch of G-Shock’s newest technology, the new GPS Hybrid Wave Ceptor GPW1000. The technology they crammed into these pieces is overwhelming in a way, but thankfully it’s as intuitive as an iPad, maybe even the Apple Watch (which is still really yet to be determined). Overall though, The GPW1000 is very easy to use. 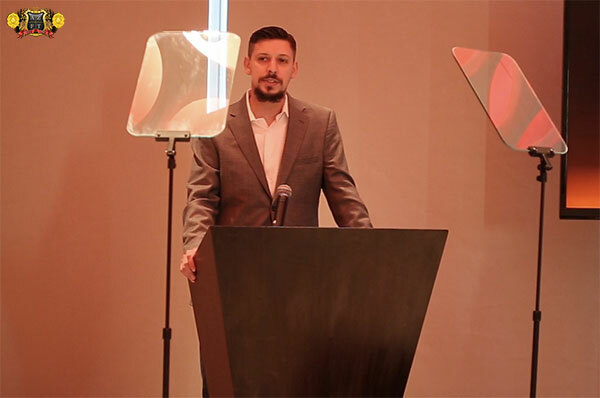 The event started and David Johnson (DJ), Vice President of Casio’s watch division started the night and when he did, you could tell he was incredibly passionate about their products. He’s not the only one, everyone at Casio takes great pride and works so well together, it’s truly impressive. 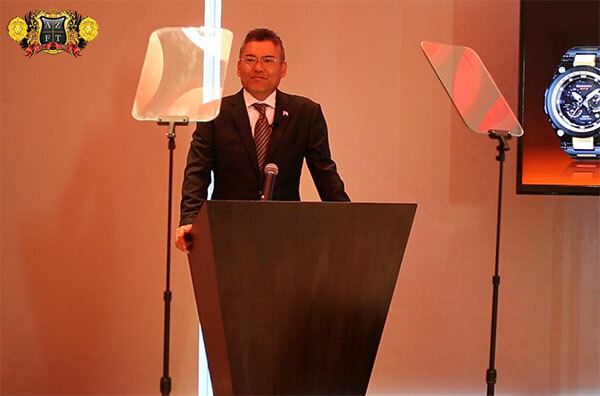 DJ then introduced Mr. Shigenori Itoh, CEO and President of Casio USA to take the stage. 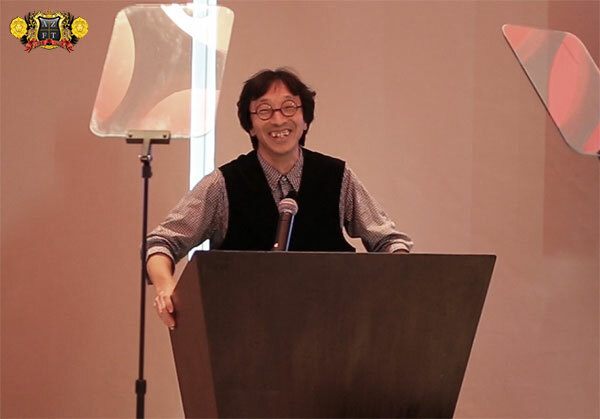 Mr. Itoh discussed the success of the Metal Twisted (or MT-G) G-Shock’s which he was a huge part in the development of. Mr. Itoh then introduced Mr. Ibe to speak about the challenges of creating the MT-G. While this video is 30 minutes long, it is very entertaining and very exciting. This proves the evolution of G-Shock in the watch world. 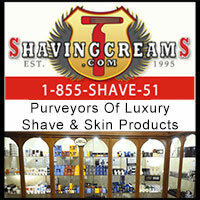 They have some amazing new products that we know everyone across the globe will love. Another part of the reason I was there, was Casio had asked me to speak at their event along with a couple of other retailers. 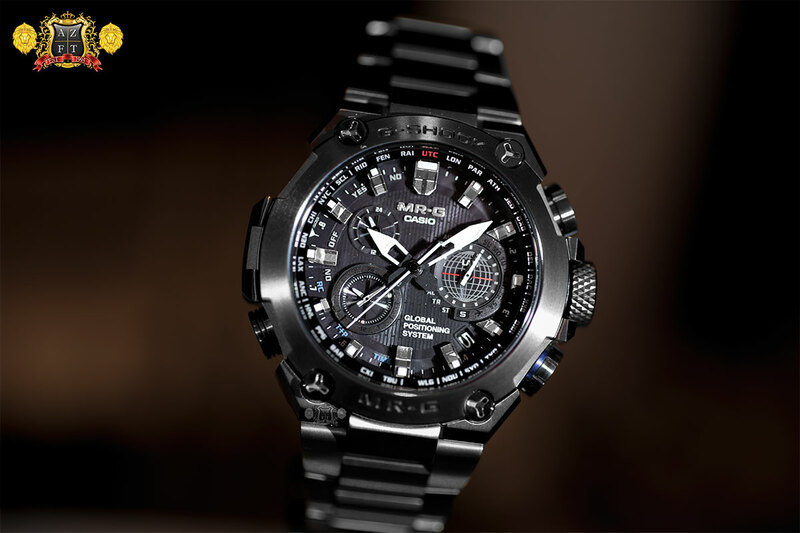 My part was to talk about GPS and it’s use in watches today, but most importantly, the expectations of the new GPW1000. 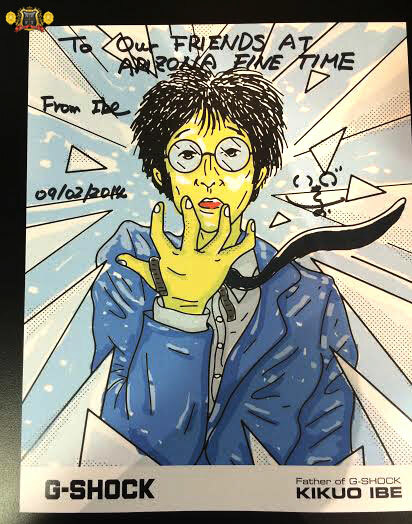 I had a great opportunity to play with the piece prior to the release and learned a lot about it. You can see our first hands on review of the GPW1000 HERE. The watches unveiled that night were incredibly impressive and expand on G-Shock’s expansion into the luxury market (especially in this country). 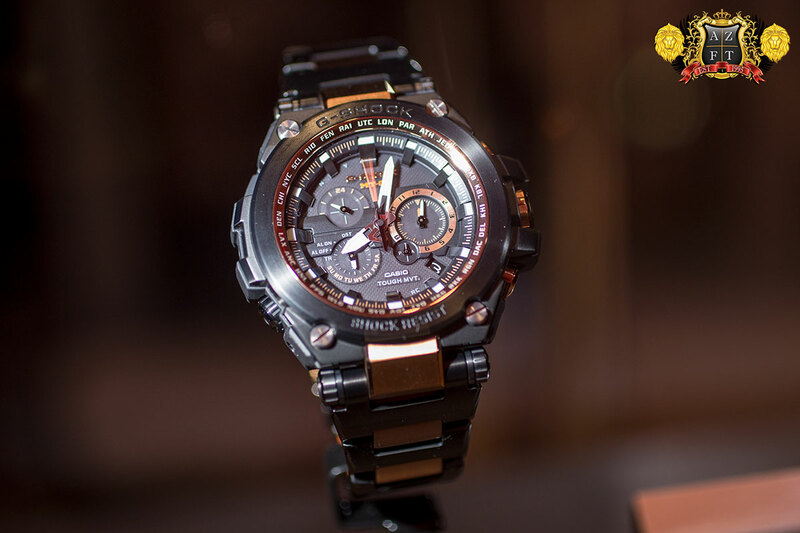 They introduced two new versions of Metal Twisted G-Shocks, one with black hard coating, rose gold and orange accents, which will be limited production under model number MTGS1000BD-5A. See it on our site HERE. Another piece introduced was the MT-G Basel World Special. Getting to see it hands on was a treat. It has a truly unique finishing process utilizing a gold ion plating that is then layered over in black. Burnishing away the gold, and blending with the black plating that gives it a distressed or vintage look to it that only contributes to its character. 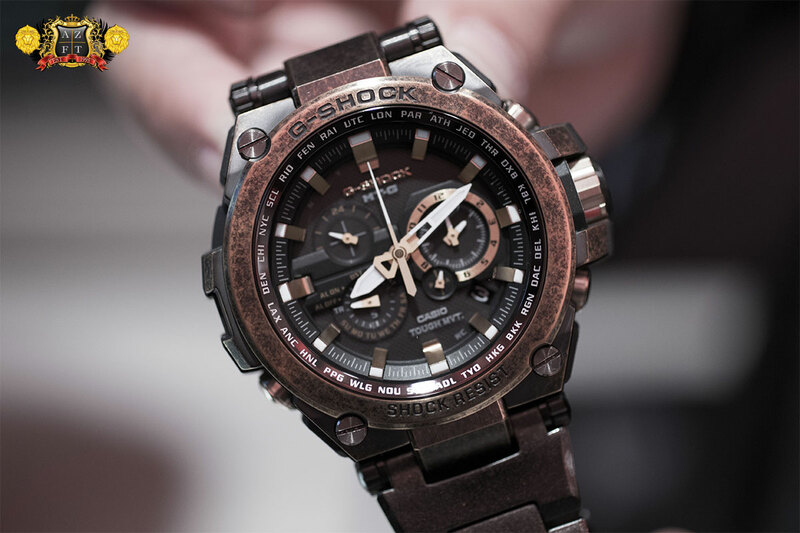 This gives a weatherd bronze type color that expresses the toughness of G-Shock’s as they are worn over the years. Sadly, this model is limited to only 500 pieces globally, and will be extremely difficult to find. 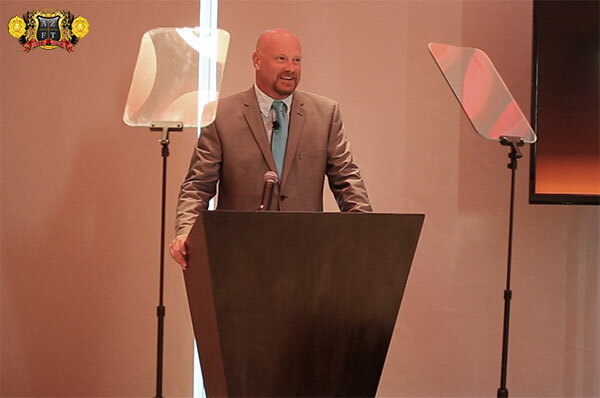 The new GPW1000 models were also featured during the event, but the big news was at the very end. For the first time ever, MR-G is making its debut in the US market! 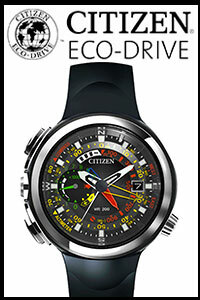 Not only that, but this will feature a MR-G exclusive version of the GPS Atomic Solar Hybrid movement. This new MRGG1000B-1A will feature a 49mm wide by 16.6mm hardened titanium case and bracelet that also has a DLC (or Diamond Like Carbon) coating. This will be now the highest priced G to ever touch US soil at a $3,000 retail. These will become available in limited quantities at the beginning of 2015. See it on our site HERE. The crowd was amazed and ooh’s and aahh’s filled the room. The night came to an end and people relaxed, had a few drinks (including some GPS-tini’s) and chit chatted for a while. Afterwards, I was lucky enough to spend some time with some of Casio’s team and our friend Ariel Adams from aBlogtoWatch. Earlier, I brought up the new Apple Watch as Ariel and DJ had a great discussion about smart watches. While I think all of us there are big Apple fans, the topic of the “smart watch” was something discussed and ended something along the lines of “that’s not a smart watch. It still needs the phone in order to really do much of anything. Now this… (as he shows the GPS Hybrid) is a SMART WATCH”. A totally proven point as it is independently controlled, has tons of functionality , breaks down the Earth to a 2.6 billion piece grid, determines your location through GPS and is powered by light, not an outlet. I’ll admit, I was impressed by the Apple Watch, but DJ had an excellent point that I totally agree with. Ariel got some really impressive pictures of the new G-Shock MR-G MRG-G1000 GPS Atomic Solar Hybrid and a great write up on aBlogtoWatch HERE. Before I knew it the trip was over and I was saying good bye to NYC. 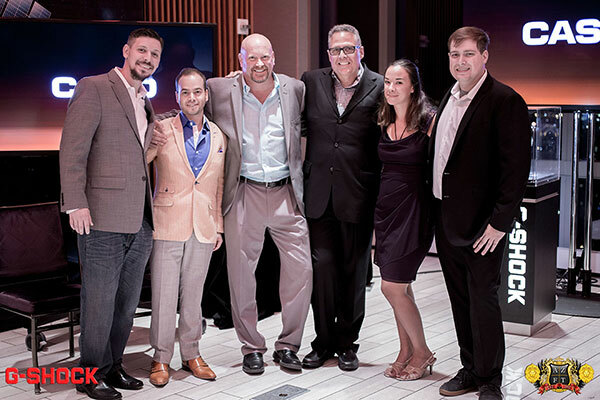 I would sincerely like to thank everyone involved for such an awesome trip and being such a great company to work with. As I mentioned in the video, all of us here at AZ Fine Time are extremely proud to be a part of the ongoing evolution of G-Shock! Can’t wait to see what’s next! 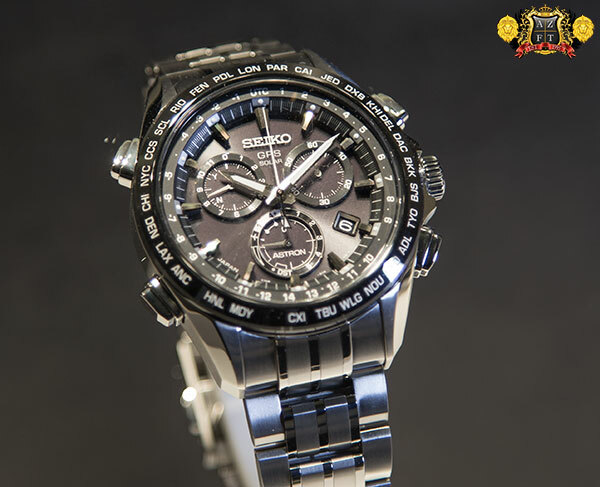 Just when you thought Seiko’s Astron GPS technology couldn’t get any better, Seiko launched their new 8X82 equipped Astron GPS Chronograph! 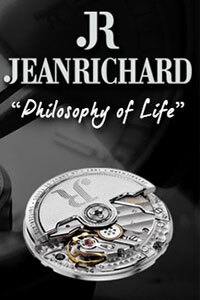 While the chrono is a new feature, there is a whole lot more to this timepiece that makes it so special. Power is everything, and the new 8X82 is even more efficient then its predecessor, the 7X52. Before we get in depth of the capabilities of the new Astron, we would like to introduce the 1st in the series, the Limited Edition SSE001. This model will be slightly different than the rest of the line up. The case size will be slightly larger then the other models at 45mm. The ceramic bezel will be faceted, and the bracelet will be titanium, with ceramic links. 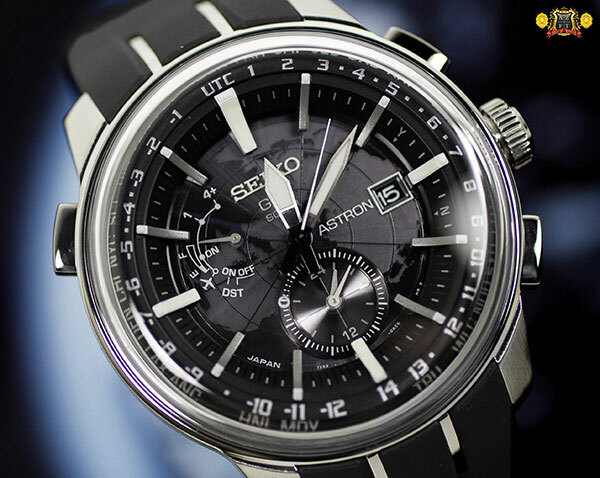 You may also notice that the dial is white, something never before seen in the Astron GPS series. Thanks to a new type of dial that allows much more light to penetrate, new dial colors are achievable in the series. The SSE001 will be limited to 7,000 pieces for the world and include a leather strap option in the package. You will see the same black dial as before seen in the Astron GPS, with the SSE003 being the 1st model in the series to have it. The 003 has titanium case and bracelet, and what is very exciting is that all the new Astron GPS Chronograph models will be coated in “Diamond Shield” hard coating, making them extremely scratch resistant. This plating technology is something we are seeing for the 1st time in the US from Seiko, but has been seen in the Japanese Domestic Market. 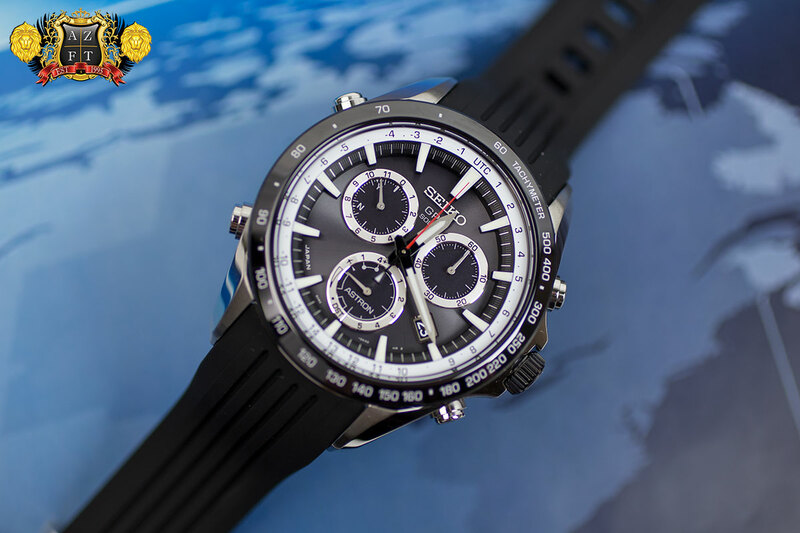 All models of Astron GPS Chronograph aside from the limited edition will be 44.6mm case diameter. A big difference from the 47-48mm in the original and “Stratoshere” series. The new dial capabilities allow for a metallic blue dial on the SSE005. Accompanied by a vibrant blue ceramic bezel, this model has been getting a lot of attention within the new line up. 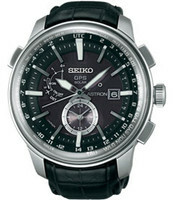 This model will also be in Seiko’s Bright Titanium with Diamond Shield coating. The functionality of the new 8X82 movement has been improved, allowing for more features, but also is more user friendly. The GPS connecting feature is still essentially the same where you will hold the upper LEFT (as opposed to the right on the 7X52 models) button for 3 seconds for 1 satellite connection (accuracy update) and 6 seconds for GPS multiple satellite connection (to update location/timezone). To change timezones manually without satellite connection, instead of holding down a button then using other buttons to change timezones, this is now done by pulling out the crown one click, and turning until the second hand points to you current location. 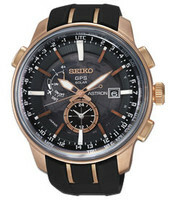 The chronograph is very easy to use at it is operated like most any chronograph. Using the upper right button will start and stop the chrono, with the lower right button used to reset. The stopwatch will measure up to six hours and as little as 1/5th of a second. The central seconds hand will act as your 1/5th of a second counter when activated. The sub dials not only register the minutes and hours, but also display the satellite connection at 10:00 and your different mode displays (satellite connection, airplane mode, power reserve) at the 6:00 sub dial. 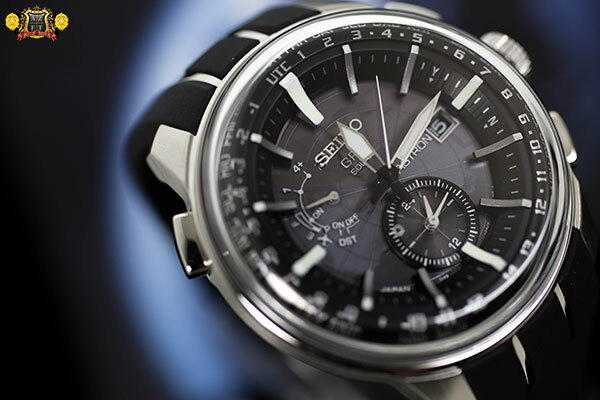 You will notice that the SSE013 pictured above has a tachymeter engraved in the ceramic bezel, instead of city codes. This model has a stainless steel case (with black hard coating), and all other steel models in the line up will feature tachymeter bezel. The SSE015 will be stainless steel case as the 013, but on the extra-strength silicone strap with 3 fold deployment clasp. 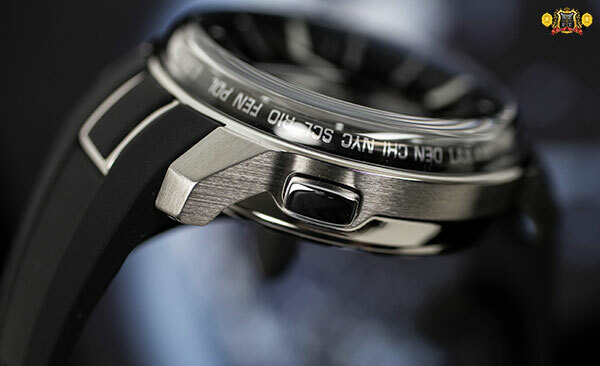 The case on this model, as well as other Astron GPS Chronographs will be finished in the mirror like, Zaratsu blade polishing technique. The craftsmanship that goes into the exterior only compliments the technologically advanced internal components. The SSE017 will have the popular color combo of black and orange, feature a stainless steel black hard coated case and come on the extra-strength silicone strap. You will notice that all of the new Astron models have larger, heavier hands. 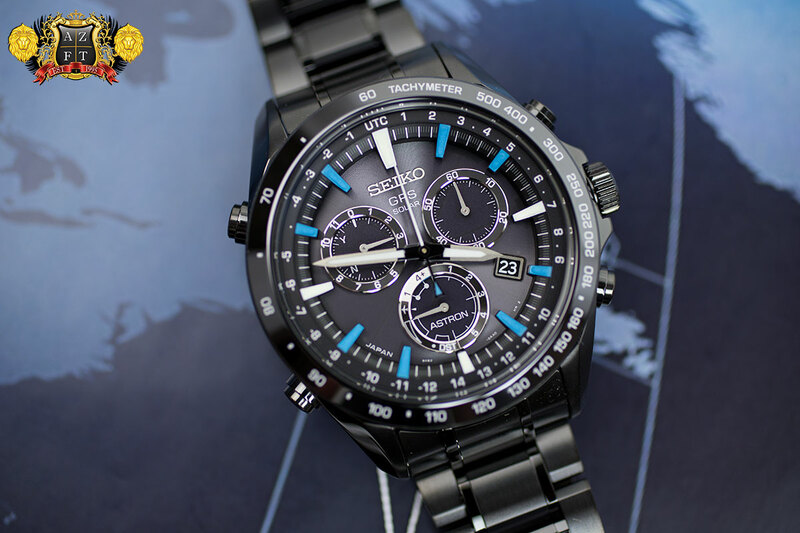 Thanks to more efficient conversion of light to energy, the watch is not only capable of moving the larger hands, but also add a chronograph feature, and reduce the size by 30%. To give you an idea of how much electricity is needed to connect to the satellites, it is equivalent to 10,000 times that of a battery watch, or 300 times that of a radio controlled watch. Very impressive to say the least. Other exciting news on this series is that now Astron will have a ladies model. The reduction of size has made this possible and while still a larger ladies piece, is still very much in trend of fashion. The dial will be white mother of pearl with diamond markers, have white ceramic bezel and rose gold plated case, with white leather strap. The new 44.6mm wide, 13.3mm Astron GPS Chronographs are scheduled to arrive this fall, and will start as low as $1,825. All models are currently available for pre-order through AZ Fine Time, and if you have any questions, please feel free to call us at 1-800-486-3996 or submit an inquiry through AZFineTime.com.